Dr Foot's Sports Insoles work wonders on problem-prone feet. These insoles are biomechanically engineered to help relieve knee, hamstring and quadricep pain. Knee, hamstring, quadricep and calf pain may affect different muscles groups but the underlying cause is the same for all these conditions. They occur when there is poor alignment of the feet (over pronation). Over pronation and inadequate shock absorption can cause stress and inflammation on the muscle groups and tendons of the leg. 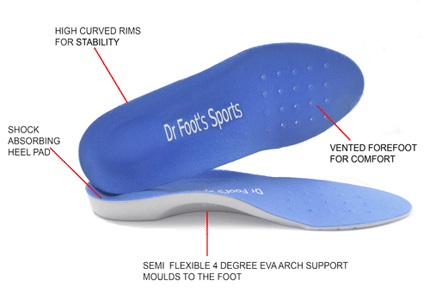 The contoured shape of the Dr Foot Sports Insoles supports your feet in two directions, both lengthwise and across the arch, for maximum relief of pain and fatigue. The special poron heel cushion built into the insole helps to reduce shock absorption. Dr Foot Sport Insoles are engineered to combat over pronation and provide greater stability and maximum support. Ideal for patients seeking arch support, for prevention and treatment of knee, hamstring and quadricep pain.